Heirloom Angel, designed by Nanette Seale, Leisure Arts Crochet Lites, 1992. Top is bent, corner & edge wear. "Nettie" Christmas Angel, TEM of California, 1978. Pattern sheet for a 3-1/2" tall angel in thread crochet. Very good condition. Angel Tree Topper, designed by Wilma Bonner, Annie's Special Occasions, Annie's Attic, 1999. Approx. 14-1/2" tall. Like new. Crochet Heavenly Pineapple Angel, designed by Jo Ann Maxwell, House of White Birches, 1997. An Exquiste three- foot- tall angel worked in size 10 crochet cotton. Very hard- to- find pattern book. Like new. Mary Maxim Spool Angels, Mary Maxim, nd. Pattern sheet from kit for angel made with miniature wooden spools. Some page wrinkling but overall good used condition. Star Light, Star Bright, designed by Pat Sessler, Pat's Crafts, 1987. Angel crocheted in worsted weight yarn uses a 4" head with hands set, and measures 12" in diameter at the bottom of the skirt. Fits over a tree top light plaque so that skirt will light up. 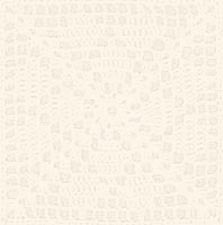 Digest-size pattern sheet in excellent condition. Christmas Angel, Marshall Cavendish LTD, 1985. Digest- size leaflet from a subscription club pattern for 9" angel crocheted from household string. Like new. Country Button Angel, designed by Donna Harelik, Crochet Village, 2007-11. 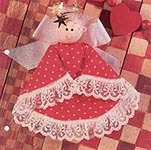 "Pattern Pack" for 18" crocheted angel doll with embroidery and button trim on dress. Brand new! Ribbon Angels, designed by Bead Lady, Darice, Inc., 1985. Two sizes angels created with beads, doll heads, safety pins, ribbon lace, and other trims. Excellent condition. Cupie Angels, Mary Maxim, nd. Pattern sheet ONLY from kit. Definitely used, but intact and readable. Crochet Victorian Christmas Tree Topper, designed by Jo Ann Maxwell, The Needlecraft Shop. 1994. Beautiful 13" angel worked in size 10 crochet cotton. Like new. Stitching Angels, JAO Enterprises, Inc., 2004. 12" tall angels, one with crochet hook and project to CROCHET and one with knitting needles and project to KNIT. Excellent condition. White Christmas Collection: Tree Top Angel in Thread Crochet, designed by Delsie Rhodes, American School of Needlework, 1999. Worked in size 10 crochet cotton. Pattern leaflet from subscription service; like new. White Christmas Collection: Heavenly Angels Garland & Ornaments in Thread Crochet, designed by Nanette Searle, American School of Needlework, 1999. Worked in size 10 crochet cotton. Pattern leaflet from subscription service; like new. KNIT Angel Ornament, designed by Edie Eckman, The Complete Knitting Collection, House of White Birches, 1999. Pattern card from subscription service. Like new, but may smell slightly of cigarette smoke. Crochet 13" Angel, Td creations, inc., 1989. Instructions for pretty dress crocheted in worsted weight yarn and trimmed in lace, to fit a 13" Bed Doll. Angel Rebekah, The Kremer Bear Claws Collection, Td creations, 1997. Worked in sport yarn for 12" tall jointed bear. Digest-size leaflet in excellent condition. Crochet Fairy Dreams, designed by Debora Gardner, The Needlecraft Shop, 1997. 5 magical fairies stitched with size 10 crochet cotton: Star, Sun, Rainbow, Cloud, and Moon. Some cover wear, but overall very good condition. Our Best Christmas Thread Crochet, Leisure Arts, 1977. 42 projects, including snowflakes, angels, wreaths, tablecloths, photo frames, doilies, coasters, sachets, edgings, stars, bells, stocking, table toppers, tree toppers, candy dish, and bells. .
Christmas Angel Filet Crochet Wall Hanging, American Thread, nd. This was a free leaflet from several years ago; filet crochet Angel wall hanging is approx. 18" wide and 24" long. Shows wear, but overall in fairly good condition. Heavenly Bells, designed by Tammy Kreimeyer, Leisure Arts, 1997. 10 angels worked in size 10 crochet cotton. Jingle bells are hung inside skirt. Very good condition. 13" Little Boy Angel, Td creations, 1994. Quick and easy angel outfit and wings for 13" baby doll worked in worsted weight yarn. New. Tree Top Angel, Td creations, 1993. Dress and wings worked in worsted weight yarn to fit13" Fragrance Doll. Cover looks pretty bad, but all instructions intact and readable. Angel Bookmark Ornaments, designed by Annie Potter, Annie Potter Presents, 2008. 5 lacy designs in size 10 crochet thread, ranging from 5" - 9-1/2" tall. BRAND NEW. Powder Room Angels, designed by Barbara Burbes, The Needlecraft Shop, 1998. Six toilet tissue / towel topper sets made with worsted-weight yarn and size 10 crochet cotton: Valentine, Fourth of July, Easter, Summer, Noel, and Any Day. Very good condition. New Millennium Angels Pattern #1: Kayla Anne, JAO Enterprises, Inc., 2000. Uses 5-1/2" air freshener doll and sport-weight yarn. Excellent condition. New Millennium Angels Pattern #2: Elizabeth Ann, JAO Enterprises, Inc., 2000. Uses 5-1/2" air freshener doll and sport-weight yarn. Excellent condition. New Millennium Angels Pattern #3: Tiffany Michele, JAO Enterprises, Inc., 2000. Uses 5-1/2" air freshener doll and sport-weight yarn. Excellent condition. New Millennium Angels Pattern #4: Kathryn Grace, JAO Enterprises, Inc., 2000. Uses 5-1/2" air freshener doll and sport-weight yarn. Excellent condition. A Joyous Angel, Dumplin' Designs, 1985. Smiling 13" soft-sculpture angel holding a wreath, crocheted in worsted weight yarn. Pages slightly yellowed, but otherwise in very good condition. Ariel, designed by Debby Caldwell, Fibre-Craft, 1996. Two beautiful dresses for a 5-1/4" air freshener doll using sport weight yarn and crochet cotton thread. Excellent condition. Angelic Host, designed by Jo Ann Maxwell, The Needlecraft Shop, 1992. Three lacy angels with crochet cotton hair; sizes range from 11" to 15" tall. Excellent condition. Angelic Ladies, designed by Jo Ann Maxwell, House of White Birches, 1996. Three delicate & lacy angels to crochet in size 10 cotton thread, with craft hair and embellished with flowers and ribbons. Celesta is 9-3/4" tall, Rosilyn is 17" tall, and Majesta is 20" tall. Like new. Christmas Clothespin Angels to Crochet, designed by Anne Halliday, Leisure Arts, 1994. Five styles worked in size 10 crochet cotton. Very good condition. Christmas Clothespin Angels to Crochet, designed by Anne Halliday, Leisure Arts, 1994. Five styles worked in size 10 crochet cotton. Cover and overall wear -- Good condition. Christmas Clothespin Angels to Crochet, Book 2, designed by Anne Halliday, Leisure Arts, 1995. Six colorful styles worked in size 10 crochet cotton. Very good condition. Angels, Snowflakes, & Garlands, Leisure Arts, 1997. 15 patterns; a variety of snowflakes, angels, and garlands. Like new. Holiday Muses, by Jan Hatfield and Lynn Wax, Fibre Craft, 1994. Crochet festive outfits for an Angel, Caroler, and Christmas Girl using sport weight yarn and doll heads/hands. Excellent condition. Angelica, by Darlene Ralph, Fibre Craft, 1992. Crochet a beautiful treetop angel using angel head and hands set and size 10 crochet thread. Excellent condition. Handkerchief Angel, designed by Eunice Svinicki, Vanna's Afghan and Crochet Favorites, Oxmoor House, Inc., 1996. Crocheted edging and halo to turn a linen handkerchief into an elegant angel ornament. Very hard- to- find pattern card from subscription series; excellent condition. Centerpiece Angel, designed by JoAnn Maxwell, Vanna's Afghan and Crochet Favorites, Oxmoor House, Inc., 1996. Lacy angel stands approximately 13" tall and is trimmed with ribbons and silk flowers. Very hard- to- find pattern card from subscription series; excellent condition. Angel Mice, designed by Brenda LeBel, Vanna's Afghan and Crochet Favorites, Oxmoor House, Inc., 1997. Pattern card from subscription series, created with worsted weight yarn. Excellent condition, but may smell slightly of dryer sheet. Celeste Angel, designed by Eunice Svinicki, Vanna's Afghan and Crochet Favorites, Oxmoor House, Inc., 1996. Pattern card from subscription series. Excellent condition, but may smell slightly of dryer sheet. Guardian Angel, Vanna's Afghan and Crochet Favorites, Leisure Arts/ Oxmoor House, Inc., 1997. Bonus pattern included with Ragtime Snowman. 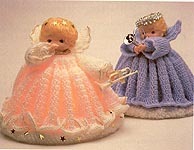 Pristine Angels, designed by Eunice Svinicki, Vanna's Afghan and Crochet Favorites, Oxmoor House, Inc., 1996. Pattern card from subscription series. Excellent condition. Christmas Angel, designed by Eunice Svinicki, Vanna's Afghan and Crochet Favorites, Oxmoor House, Inc., 1995. Crochet with size 10 crochet thread. Shoulder Pad Angel, Oxmoor House, Inc., 1993. Fabric covered shoulder pad trimmed with lace and ribbon. Head is 1-1/2" styrofoam ball. Very good condition.